In many employment and independent contractor agreements, the employer will attempt to limit your future work. The intention is to prohibit you from competing with the employer once you no longer work with it. However, restrictive covenants can often be too broad, limiting your ability to earn an honest living. Because of the potential for restrictive convents to be too constraining, Florida limits their validity. However, many restrictive covenants are perfectly reasonable and Florida courts will rule in the employer’s favor. 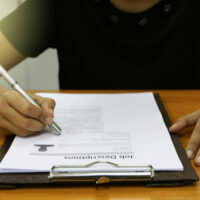 To learn more about restrictive covenants in employment agreements, whether when you are drafting a contract or dealing with the ramifications of one, contact an experienced West Palm Beach business law attorney today for help. Under Florida statute 542.335, restrictive provisions within a contract will be upheld so long as they are reasonable in time, area, and line of business. This means if you are challenging a restrictive covenant in an agreement you signed, the court will look at the type of business it prohibits you from accepting, in what geographic area, and for how long. A covenant that restricts you from taking on competing clients within the same state as the previous employer for one year will likely be upheld. However, a provision that prohibits you from taking on competing clients across the U.S. for 10 years may not. However, these factors will be viewed in light of your actual situation. A court will not enforce a restrictive covenant unless it is set forth in writing signed by the person against whom enforcement is sought. The person seeking enforcement of the restrictive covenant shall plead and prove the existence of one or more legitimate business interests justifying the restrictive covenant. A person seeking enforcement shall also plead and prove that the specific restraint is reasonably necessary to protect the legitimate business interest. The person fighting the covenant has the duty to prove the provision is too broad, long, or otherwise unreasonable. Florida law regarding restrictive covenants has a number of other provisions related to how a court will determine whether a provision is valid, reasonable, and enforceable. For greater detail on Florida’s restrictive covenant statute and case law, contact an attorney today. A restrictive covenant not supported by a legitimate business interest is unlawful, void, and unenforceable. For example, when a small business is attempting to enforce a restrictive covenant, it may have considerable evidence that a previous employee competing with it while having in-depth knowledge of the business’s confidential information and customer base will hurt its bottom line. However, a national chain may not be able to support that an independent contractor or previous employee is likely to take away enough of its business to hurt its profits or reputation. Florida’s law regarding restrictive covenants is generally pro-business, which means if you are a previous employee or independent contractor, you are not likely to get out of a restrictive covenant in the future unless it is clearly unreasonable and unnecessary. However, to learn more about your rights while negotiating a contracting or fighting an enforcement action, call the Law Offices of Larry E. Bray, P.A. at 561-571-8970.